As it happens, some of my friends aren’t big fans of birthday cake. While I’m sure the sentiment of a dark chocolate fudge cake would be appreciated, for some there is another sweet treat they prefer to be laden with candles on their big day. For Chris’ birthday I baked these fudgy smoked salt Nutella brownies which went down a treat and for my 27th, he piled up my favourite doughnuts made in Finnieston and laden them with candles. So when my best friend happened to be popping round for drinks, dinner and our 117th viewing of Scary Movie 3 ahead of her birthday, I decided to forget about cake and make cinnamon rolls instead. Vegan baking doesn’t scare me half as much as it used to, partly due to the amazing rise in blogs, restaurants and cafes dedicated to dairy free, egg free and gluten free treats. Since starting my own space on the internet six years ago, flax eggs, applesauce, aquafaba and avocados have been instrumental in making cakes that anyone can eat. My bestie, who has been vegan for years, is constantly teaching me new things about how to modify so-called classic bakes and the knowledge is exciting to explore. 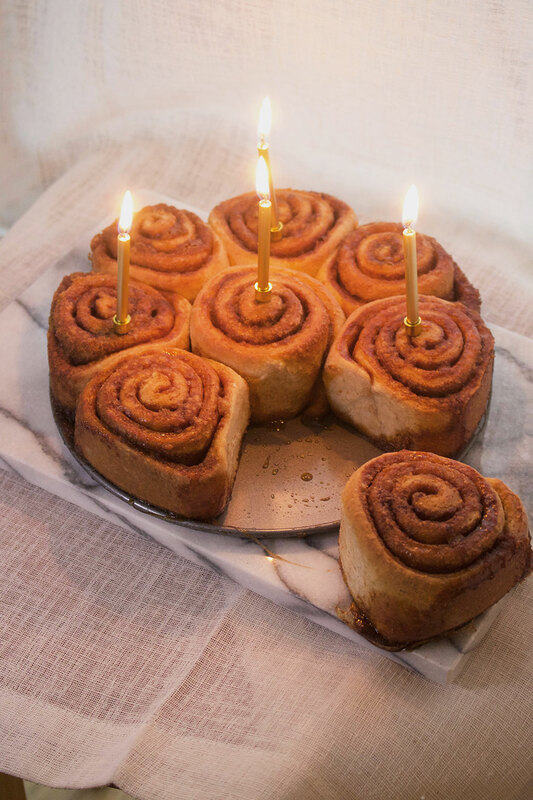 So when she stepped into my flat to the smell of coconut oil, caramelised sugar and yeasted swirled buns, she was delighted to find the cinnamon rolls covered with candles were vegan friendly in her honour. Incidentally, she explained, cinnamon rolls are her favourite and I hadn’t even realised. 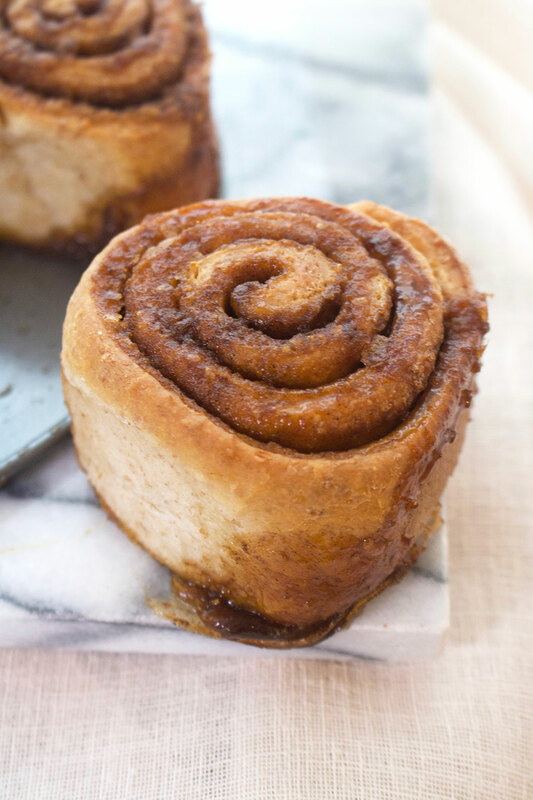 These cinnamon buns are really rather easy to make and don’t take too much effort to transform into swirly buns of spiced goodness, aside from a little kneading. The flavour is roughly the same and I didn’t really miss the buttery filling as coconut oil provides a lighter flavour when sprinkled with cinnamon sugar. 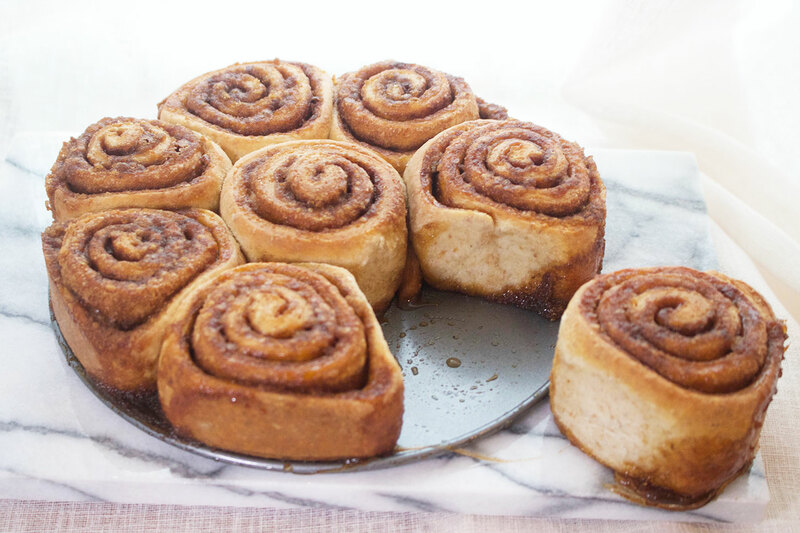 While I left these rolls plain, served slightly warm as my vegan friend and three omnivores devoured them with prosecco after the candles were blown out and wishes made, they would be equally as tasty with a quick glaze for extra sticky sweetness. In a saucepan, whisk together the flour and water over a low heat until the mix creates a thick paste. Set to one side to cool. Once the paste has cooled, add to a large bowl and mix in the lukewarm water until smooth. Sprinkle over the yeast, mixing well. Add the flours, sugar, salt and oil then mix to create a shaggy dough. Turn out onto a clean floured surface and knead for ten minutes until the dough is smooth and elastic. Rub the dough with a little drizzle of olive oil and set back into the bowl, covering the top with clingfilm. Leave to prove in a warm place for 1 to 2 hours until doubled in size. In a small bowl, whisk together the brown sugar, cinnamon and nutmeg then set aside. Brush a 23cm round tin or 20cm square tin with a little coconut oil then set to one side. Turnout the dough onto a well floured surface and roll into a 40cm by 30cm rectangle. Brush over the coconut oil then sprinkle over the cinnamon sugar. Starting from the short end, tightly roll the dough until you end up with a thick sausage shape. Using a sharp knife, cut off any untidy ends, then cut eight equally sized buns. Arrange the buns cut side up into the baking pan then cover with clingfilm. Leave to prove for a second time for 30 minutes until puffed up. 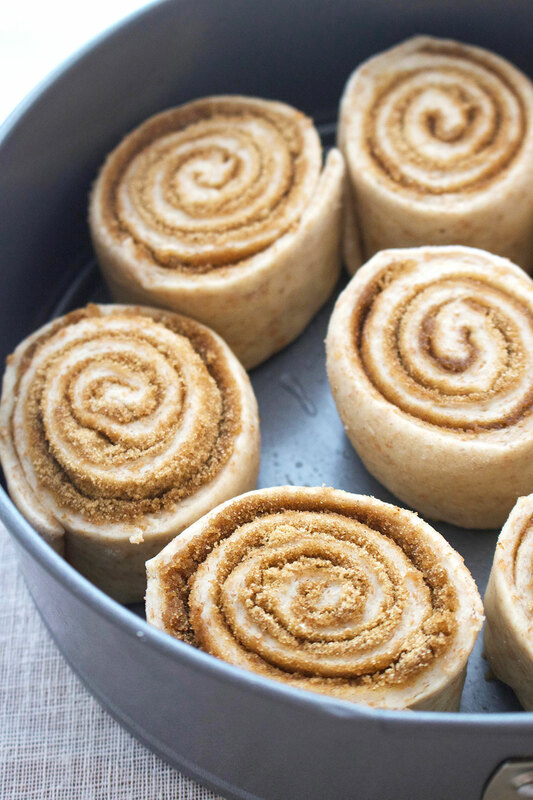 Preheat the oven to 180oc/160oc fan and once hot, remove the clingfilm from the tin, place the tin on a baking sheet and bake the cinnamon buns for 30 to 35 minutes until golden brown. Remove from the oven and leave to cool in the tin. Pull the buns apart and enjoy warm with coffee or candles and champagne. Drown in a sugar glaze if you wish, but these buns don’t really need it. Oooh, these look scrumptious! I can never say no to a cinnamon bun.